Between July 2017 and March 2018 we made Yırca Soaphouse Project with Yırca Hanımeli Handmade and Homemade products (Yırca Village Association, Yırca Hanımeli Commercial Enterprise) in Soma, Manisa. The project is about transform to a 100 years old stone house and it’s garden for soap and food production and renew the grocery shop which is next to the house as a cafe for women. 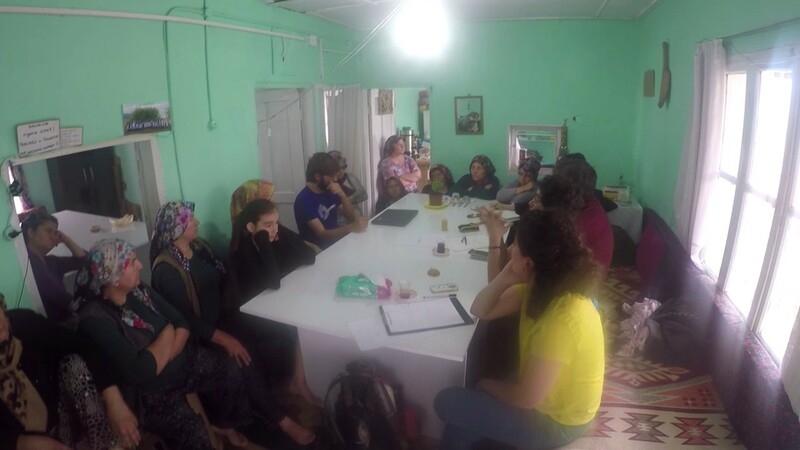 The house was bought by Yırca Hanımeli Association, which tries create alternatives against ruinous effects of the coal economy on nature and people and aims to attach the women into economic life in a sharing way. In January 2016, Tider pulled-out from the project and Kenan Kahya, who came into village voluntarily during resistance period and worked in this project for Tider, decided to quit his job and move into village permanent and help women to improve soap production. After this decison and the meetings with women and mukhtar, Yırca Hanımeli was founded as a Commercial Enterprise of Yırca Village Association and they intended to work in a different structure then former period, based on togetherness, commons and horizontal hierarchy. 25 women signed a “goodwill agreement” and began to work in 5 departments; under production supply, production planning and under derivation social media promotion, sell/order. All these departments works and economical management began to make by women in periodically shifts. This structure, in which also systems to share the earnings in the most fair way are tested, continues today. Beside productions for bulk orders, they are accepting indivisual orders on Good4trust website. We have known Kenan and Yırca since the begining of this process. They started their second crowd funding campaing in August 2016, for a house which will help food production, besides producing soap and end tenant situation, a house which is will be an example to protect Yırca’s old stone house. The slogan of the campaign was “We dream a home!” Beside this campaign, wtih the support of more than 750 people which includes students from university clubs and employees from different firms, they bought a 100 years old stone house, in which Grandma Nazife lived 97 years and the grocery store next to it. We decided to do the renovation work of the house when we first met and helped to spread campaign. After the purchase of the house, we started to design and construction process with an expedition in June 2017. We talked with the women on renewal the two-storey stone house as a soap production area and warehouse, taking away the open roof structure called as “saya” in the garden to built a food production area and renewal of the grocery store as a womens’ cafe for their meetings and hosting guests. We also measured and drew the plan and sections of the space for design workshop. You can check our blog post for this expedition. After expedition, we decided to make design workshop between 16-19 August and construction workshop between 6-16 September to enable the students to join this workshop in summer time and to continue the subject warmly by taking a short break between these wokshops. Also, we decided to work with Architect Hayriye Sözen as the consultant of this project. Firstly, with attendance of 9 architecture and landscape students from different universities, 4 association members and Kenan, we gathered for design workshop We’re Mimarlık Office in Kuzguncuk, İstanbul. Besides using We’re’s facilities, office’s employees, which are also our association’s members, and interns got involved our design workshop. In the first day of workshop we got the change to experience what a food production area needs, with a visit to Gekoo in Çengelköy. We tried to make our main design decisions before the construction workshop in this design workshop. At the last day Hayriye Sözen also attended the workshop . In addition to the plan and section works of the building, we also produced ideas on the design of the units such as storage, bench, seating for each space and garden. Kenan immediately returned to the village and shared these ideas with the women and we started the preparations for the construction workshop together with comments from women. 3 days before the start of the workshop, we went to the village and took part in preparations such as dismantling, cleaning, supply of materials and rectification concrete. On September 6, we started the construction workshop with 11 students, which includes new attendances except design workshop, and 4 members of our association. The main work of the workshop was the rough construction works of the food production area. We made a base beam under the new walls, built the walls on the 3 sides with masonry bricks and tied these walls with the old stone wall with a beam above the windows, , which also have a garden wall on the windows, connecting the molds of the beams, connecting the iron and pouring the concrete. Except of the help of a mason for a one day, all the works were carried out by the workshop participants and the villagers. Apart from the works in the food production area, we dismantled the soil plaster of the walls in the soap production are, divided the storage area into two by building a wall, opened a door for the second storage room, repaired the deficiencies of stone wall of the garden, made the soil plaster for inside and outside of womens’ coffee, started the repair of the roof of womens’ coffee, built the wall and the renewal works of electrical installation with an electrician. This workshop helped us to improve our knowledge about construction methods by building a lot of thing by ourselves because of the lack of regular craftsmen. And beside conventional construction materials, we made some natural material experiments, adopted different materials for lacking materials (producing molds from Osb panels etc.) The budget of the constructions put together from saving from womens’ incomes since December 2016. During the workshop we stayed on the top floor of the soaphouse and in a house in the village. Our meals were made by women in shifts. After we brought rough construction works to a certain stage, we planned the works that were left with Hayriye Sözen, who came to the village towards the end of the workshop. We ended the workshop on 16 September because of the starting semesters of universities. However, after this date, we continued to go Yırca and helped ongoing works. In the ongoing works women, Kenan and craftsmen built the roof of food production area, womens’ cafe, the toilet and the entrance, built the oven next to food production area, produced the windows and doors, inlayed ceramics for food and soap production areas and the toilet, covered the ceilings with waterproof and non-flammable plasterboards, renewed plumbing, organized the garden and built a wooden door for the entrance of the garden. We kept getting involved in these works with visits in October, November, January and February. The budget of these works were covered with income by simultaneously soap sellings, donations from volunteers, Hayriye Sözen’s support for craftsmen and material and donation support from ABS company. Because of the limited budget, labour force and possibilities of materials can be found in Soma, we had rethink about the details on site of roof pediment, steel profile bearings of tables and wooden garden door. After the completion of the construction works, opening events were held on March 8, International Women’s Day and the week in Yırca Soaphouse. In addition to our members and workshop participants, Kazdağı Association for the Protection of Natural and Cultural Assets and the volunteers also attended the opening, which ended the long-term construction and celebrated all the efforts in the process and the new era of Soaphouse with a coming atmosphere of the spring. As of this date, the remaining shortcomings continued to be made from time to time, while the necessary permits were taken for food and soap production areas. Now, women who continue their production and training activities by using every place in the soaphouse and Kenan’s aim in the coming period is to share their experiences with other villages and inspire the emergence of similar processes at those villages. In addition, a booklet or guide-like publication describing the process is planned. The Yırca Soaphouse project, which we love from the first day with its story, is a very learned experience for both our association and everyone involved in the process, especially because since the day we were established, we try to build same similar horizontal hierarchy, organization and labour sharing processes. We thank to all people of Yırca and Kenan for their warm hospitality at our every visits and workshops, to We’re Architects for productive design workshop and to Hayriye Sözen for her sincere interest about the project. You can check our notes from expedition, design and construction workshop and visits from the projects blog page. You can support Yırca Hanımeli by buying goods from them for this web page, or you can connect them via yircahanimeli@gmail.com.